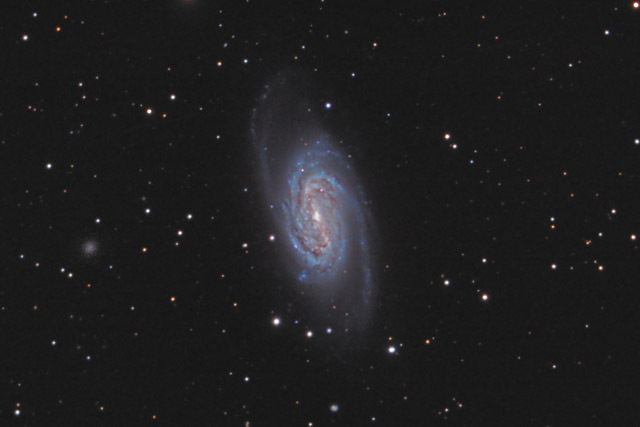 NGC 2903 is a superb example of a barred spiral galaxy. Located in Leo, the galaxy has a large star forming ring around the nucleus. For this reason, NGC 2903 is known as a "hot spot" galaxy. Similar to starburst galaxies such as NGC 6946, "hot spot' galaxies have higher than normal amounts of star formation, but not as much as a starburst galaxy. NGC 2903 also has several large HII regions, similar to the large HII regions in M33. Software Used Images Plus 4.5 for camera control, calibration, stacking, digital development, and smoothing. Photoshop CS5 used for levels and curves, color balance, high pass filter, star shrinking, saturation adjustments, vibrance, match color, lab color, sharpening and noise reduction. HLVG for additional color correction. Gradient Xterminator for gradient removal. Carboni Tools for additional saturation adjustments, noise reduction, and smoothing. Notes I used a number of new processing techniques with this image, and I'm fairly pleased with the result. NGC 2903 is a beautiful galaxy, so I was determined to develop a worthy astrophoto.